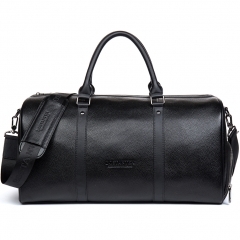 HIGH QUALITY MATERIAL:The leather travel bag is made of high quality genuine cow leather, durable fabric lining, with custom hardware, heavy-duty zipper. zipper closure for your security. STRUCTURE: The oversized duffel bag contains 1 big inner compartment, 1 inner zipper pocket, 2 side small pockets, 2 outside zipper pockets pocket offers protection for iPad mini. 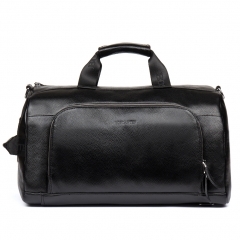 This weekend bag easily hold your 15 inch Laptop, iPad, iPhone, clothes , shoes and other Things. 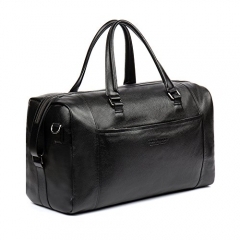 The weekend bag is ideal for plane or train travel. The removable shoulder strap is adjustable and padded for comfort. DIMENSIONS: (L)15.74" x (W)9.84" x (H)9.45" inch, with approximately 7.87 inch handle. STYLISH: The single gusset construction expands for greater carrying capacity. It can use as a travel bag, backpack, gym duffel bag, sports duffel bag, overnight bag, weekend cabin duffel bag, carry on duffel etc .